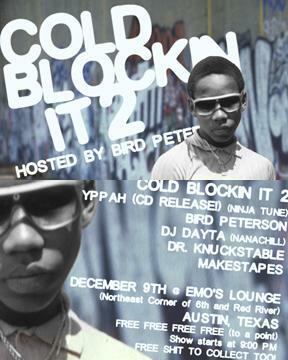 Cold Blockin It 2... as in the follow up to Cold Blockin It... with some of the usual suspects... Yppah, Bird Peterson, Dr. Knuckstable, and some new characters... DJ Dayta and Makestaples... on Saturday, Dec 9th at Emo's Lounge. So... just found out today I'm going back to Zurich... but this time for 2 months! Mom's worried... heck... I'm worried. But what can you do... gotta do what you gotta do right? I don't really mind going... it's just bad timing with the holidays and all... and what am I gonna do without Austin Hip Hop?